The refrigerator is an extremely functional appliance for most homeowners. Choosing the right fridge for your kitchen is a little like choosing the right shoe for your foot. It needs to be a good fit, it needs to coordinate, and it needs to meet the demands of the ‘terrain’. The first refrigerator for home-use was invented in 1913, and since then there have been several versions that have made their way onto the market. 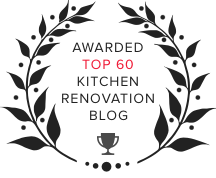 So, we wanted to provide a quick run-down of the different varieties and how they can solve typical kitchen problems like a lack of space, poor layout for productivity, difficulty with organization, and wasted food. It’s the tried and true refrigerator style with which we are all familiar. It has good reason to be known as the “standard”, the freezer on top makes a lot of sense. Top mount compression makes for cooler interior temperatures, is clog resistant, and maximizes interior space. The typical width for this fridge style is between 23 and 36 inches. It’s a great option for smaller families and homes with lower occupancy, because the storage capacity is adequate, but not too much so that food goes to waste. Also known as the “side-by-side” fridge, this style of refrigerators arrived on the scene in the 1970’s. We’re not going to lie, this is probably the best fridge for midnight snacks! It’s nice and easy to open both doors and view the items in the fridge and the freezer. This design also introduced the front-door water and ice dispensers. Over the years these models had gained a reputation for inefficiency, but they’ve caught up and are generally just as efficient as their upright counterparts. Although the water and ice dispensers can require additional water access, these French Door units are wonderful options for families with children, since they can easily grab a glass of ice water without assistance. There’s also additional storage space for freezer items, which can be useful for large families. The typical side-by-side fridge measures between 30 and 36 inches in width, making it a great choice for more spacious kitchens. In this instance, the freezer is located underneath of the refrigerator section. 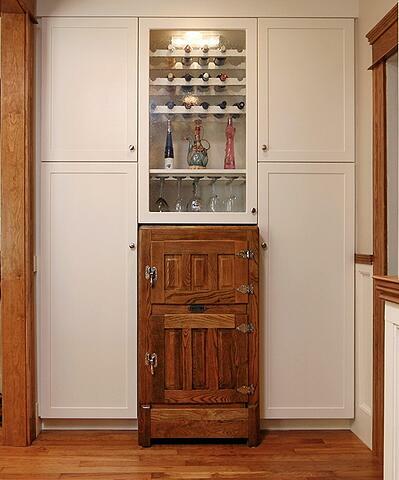 The top fridge portion can be either a single door or French door design, like the one shown below. This option is nice because it makes refrigerated foods easier to access. If you do not go into the freezer very often, this may be the best fit for you. And, since the freezer is a pull-out drawer, items will be easy to access there when you need them. These models can range from 23 to 36 inches, making them a versatile selection for kitchens small and large. 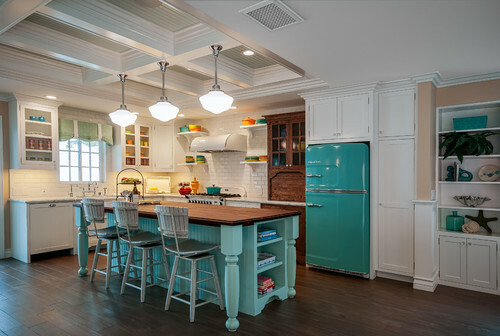 The look of refrigerators from the 50’s and 60’s is making a huge comeback. 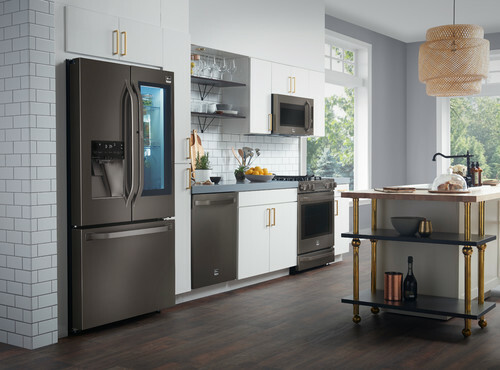 Not only are kitchen designers having antique fridges refurbished, but even better – companies are making brand new models that look like those from the days of nostalgic yesteryear. The majority of these vintage-inspired fridges are the standard top-freezer version, and are over 30 inches in width. They tend to run on the higher-end of price ranges, but if you’re looking for a stylish and remarkable refrigerator, then this is probably the refrigerator for you! 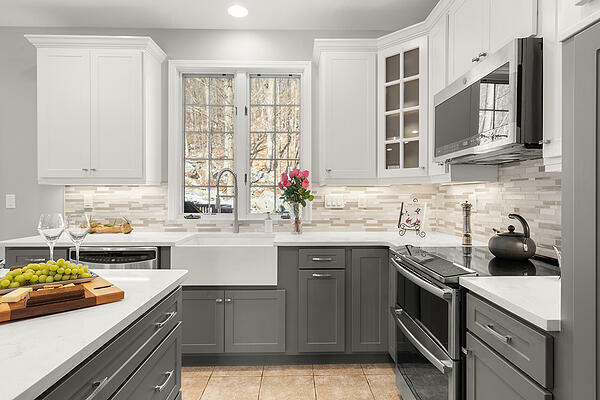 Can’t decide which color appliances will match or coordinate with your kitchen’s color scheme? Time to integrate! 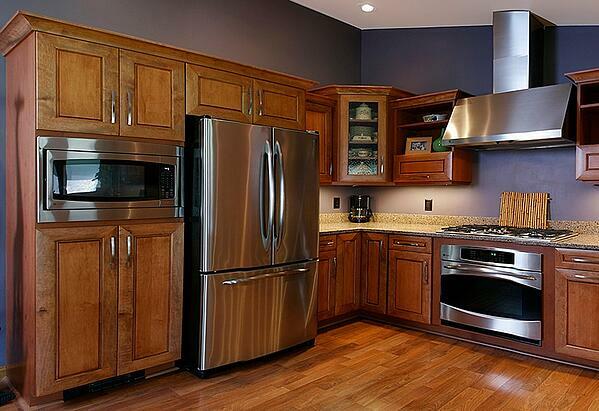 You can have your refrigerator perfectly match your cabinets. If a seamless look is what you seek, then this is probably going to sound very appealing to you. 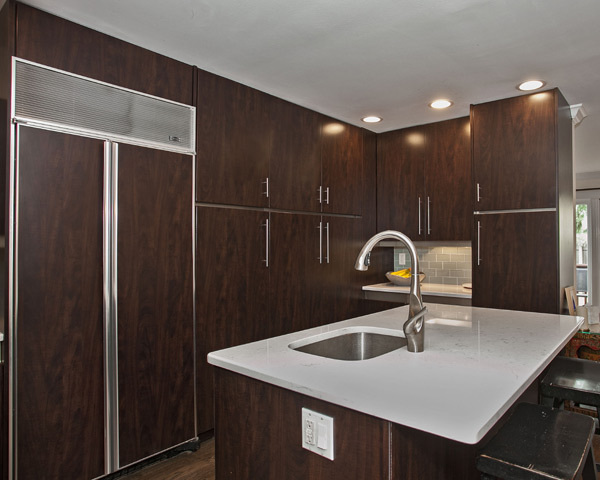 In this example below, our Kitchen Magic installers refaced the homeowner’s cabinets, as well as the refrigerator for a flawless match. The finished result is polished, bringing form and function together to maximize the flow for a smaller kitchen with limited floor space. The drawer refrigerator takes integration to the next level. 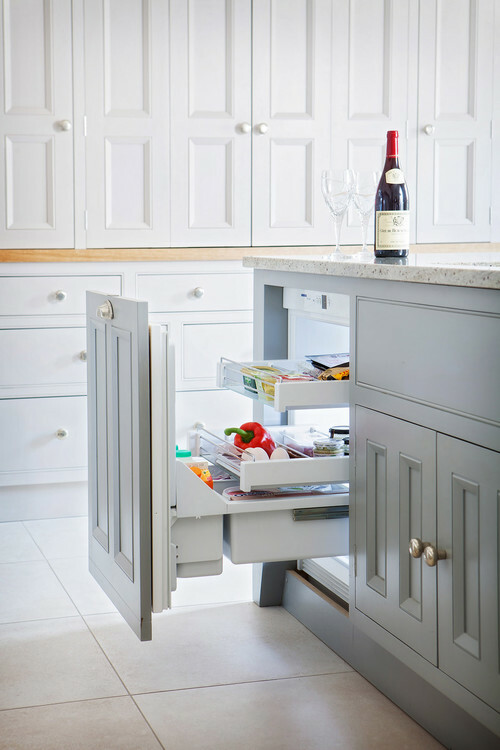 For kitchens that lack floor space, but have some excess cabinet space – this is the ideal choice. 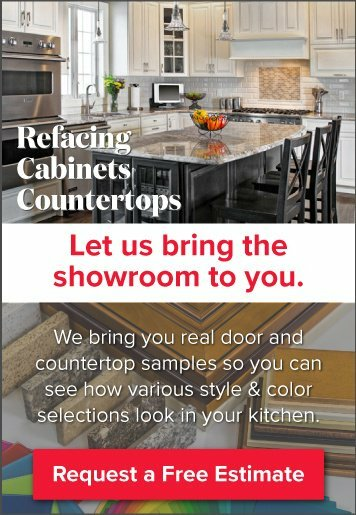 Imagine your refrigerated items living in a drawer that matches your cabinets perfectly, with the need to match or coordinate appliances no longer being an issue. This option is going to be the most labor intensive, and potentially the most expensive option of those we’ve listed here. 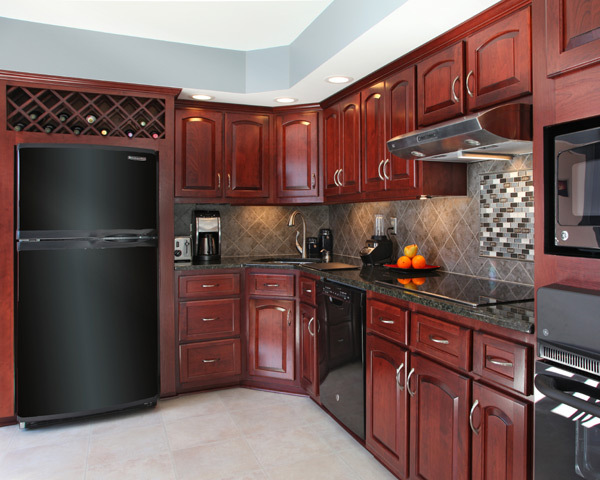 But, if you’re in the market for a kitchen remodel, we suggest considering this seamless refrigerator style. It may be more within your budget than you expect. Smart fridges are also known as “internet refrigerators”, because they are connected to the internet – simple enough! Well, not that simple, actually. These impressive marvels of technology can sense what kind of products are being stored within them. They utilize barcode and RFID scanning to identify foods, cool them to the ideal temperatures, and let you know when things are going to spoil to help reduce wasted food. And, because this refrigerator is basically a computer, you can download apps to play your music, connect to your calendars, shopping lists, and more. Most smart fridges are available in the French door style, with a touch screen display panel on the right-side front door. These are some, but not all the refrigerator options out there. Who knew there were so many varieties? It can be a little daunting when you start out to search for the perfect fridge for your kitchen. With any hope, this little summary can bring you some insights into which option is best for you and your family. The refrigerator is, after all, the hub of the heart of your home!